K seires gearmotor is a right angle mounting way with helical-bevel gearing sets. We are offering K Series Gear Motor.Product Description: Helical-bevel gear units from SEW-EURODRIVE provide a high degree of efficiency of over 90% in Industry Standard. 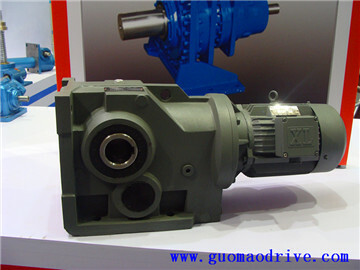 Our dimensions of this gearmotor is exact same as SEW europedrive's. and aslo for the model number. So it is an ideal replacment for this famous brand. Quality is competitived but lower prices. The helical-bevel gears gives a more efficiency than other types of gearing such as helical-worm types. Some clients often misunderstand these two type gears. Actually, they are much different. The helica-worm gearbox has a low effiency and right for some light industries. and the helical-bevel gears are higher price than the helical-worm type. Of course, in a suitable industry to choose a right model, this is the key. 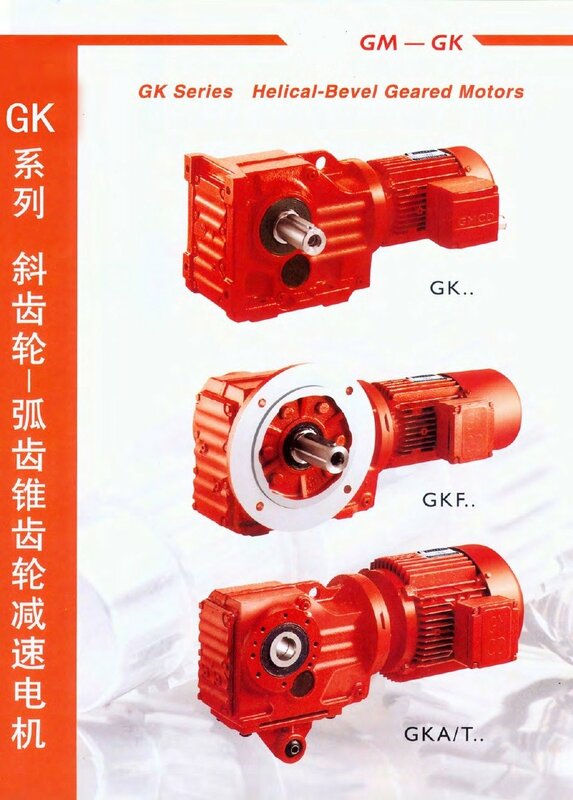 Our K series gear reducers can be with motor in VFD or brake or both. In the gearhead, it also can be coupled with a torque arm, some calls Mounting plate. they are same. To provent the complete sets move and easy to operation. The complete sets with gearheads and motor, is in various mounting. Upper or down or left or right. Almost for every usage industry. Output shaft can be made in a spline with key which is usually for crane or hosit duty. 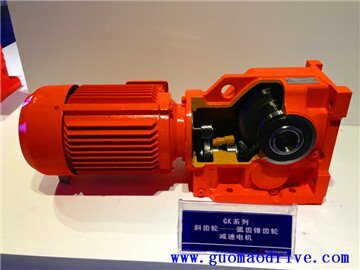 For the helical bevel gearbox, there might be two soild shafts or hollow shafts output in both sides. Input part, it is with flange to couple a electric motor. It is easy for the maintance. Also, the gearhead can be sole usage. with solid shaft input type.In the houllow shaft type, if needs, it can be with a shrink disk to controll the diameter of the output hole. The standard type is single stage. But if you need a double stage or even three stages, it will be alright. The ratio for the more stages is big which can make a bigger torques. That's the K series gearm head with a R series helical gearhead whcih are coupled together and connected with the AC or DC motor finally.